"Tyrants cut out hearts. Rulers sacrifice their own." 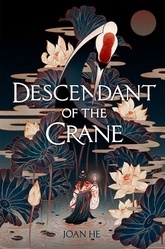 Princess Hesina of Yan has always been eager to shirk the responsibilities of the crown, but when her beloved father is murdered, she’s thrust into power, suddenly the queen of an unstable kingdom. Determined to find her father’s killer, Hesina does something desperate: she engages the aid of a soothsayer—a treasonous act, punishable by death...because in Yan, magic was outlawed centuries ago.